It is important to keep any business clean to stay ahead of your competition. However, this is no easy task to deal with, and that is why having the right mop bucket is important. Whether you’re running a big institution or a small business, having the right commercial cleaning equipment is necessary to become successful. 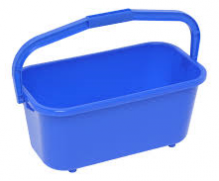 Let’s have a look at the buckets and other cleaning products that we have to offer today. 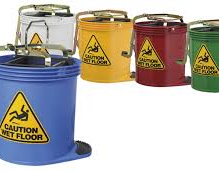 Our ergonomic bucket design comes with elevated castors that make them easily manoeuvrable wherever they are needed. This design features a removable dirt tab and drains plug that is intended for easy cleaning. 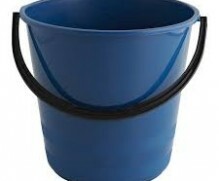 The ergonomic buckets come with their own wringers too and are available in various colours. 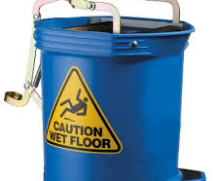 We offer flat mop buckets that are great for pre-soaking microfiber pads before being used for flat mopping. 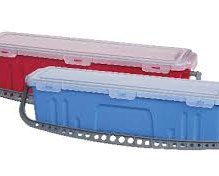 Its lid contains a neoprene foam seal to help avoid leaking when being transported to a different location. Its ergonomic handle comes with a grip that is comfortable to use. 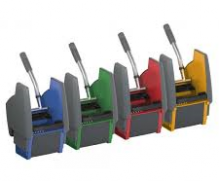 Our flat mop buckets are recommended to be used together with Oates microfiber flat mop pads. Besides our single choice buckets, we also offer a wringer and mop bucket combo for people looking for a lightweight and hygienic choice. 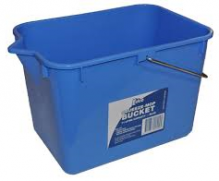 The durable plastic that our buckets are made of makes them ideal to be used for heavy-duty requirements. These combos are available in five colours and are easy to move around. 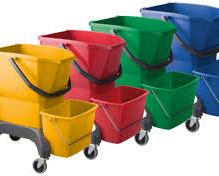 If you are looking for top quality mop buckets, wringers and commercial cleaning equipment, be sure to check us out at Alpha Cleaning Supplies.